More than 20 large wildfires burn in western U.S.
PANGUITCH, Utah -- More than 20 large wildfires were burning Monday night in the western U.S. The largest has burned more than 67 square miles in southern Utah. Authorities say southern Utah's wildfire, near the ski town of Brian Head, has forced more than 1,500 people from homes and cabins. More evacuations were being ordered. More than 1,100 firefighters have been called in to battle the blaze, which has spread in two directions, CBS News correspondent Jamie Yuccas reports from Panguitch. After a day of calmer weather, strong winds picked up again Monday along the fire's northern edge. Crews raced to bulldoze a fireline along the perimeter to keep the flames at bay, Yuccas reports. The fire, which officials say was sparked by a weed-burning torch on June 17, has cost more than $7 million to fight. Families who have lived in mountainside communities in Brian Head for generations now anxiously wait to find out if anything's left. "Sleepless nights… We have 20 years of memory on that mountain. That's our DNA on that mountain," one resident said. Meanwhile, crews in California are allowing people back into their homes near Santa Clarita. 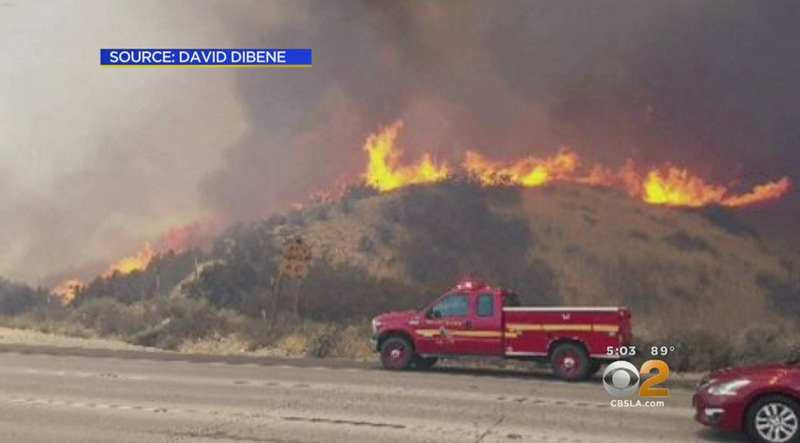 CBS Los Angeles reports that a blaze there consumed at least 750 acres, causing authorities to close a busy thoroughfare in both directions. The 14 Freeway has since reopened. Nearly 80 homes were affected, forcing 100 residents to leave the area. At least 220 firefighters fought the blaze and it burned towards Disney Ranch. California Highway Patrol officers say the blaze was started by a truck that caught on fire after it was involved in an accident. In Arizona, where 100 degree temperatures continue, dry conditions are fueling a wildfire near the city of Prescott, Yucca reports.